Above: A Columbia Pictures publicit portrait of Clancy Cooper, circa 1945. Clancy Cooper’s solid build, square jaw, and tough Irish face firmly typed him as a policeman for most of his Hollywood career. He played uniformed or plainclothes cops in the majority of his films, and his non-flatfoot characters were usually gruff and authoritative types as well–Western sheriffs, barkeeps, army sergeants, or underworld roughnecks. Cooper was generally relegated to uncredited character parts, but was such an “ideal type” that he was repeatedly utilized by producers, and thus enjoyed steady work. 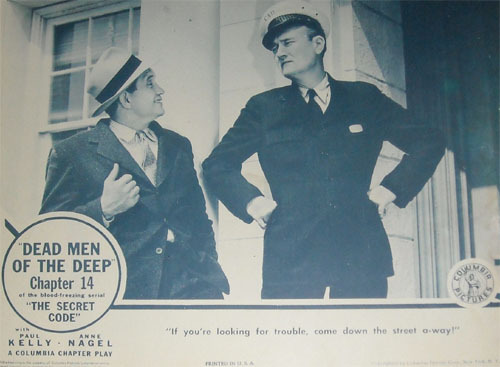 Two of Cooper’s biggest screen roles came in a couple of 1940s serials, one of which allowed him perhaps the best showcase of his whole movie career. Clancy Cooper was born in Boise, Idaho. He attended the University of Iowa as a young man and later enrolled in the drama school at Carnegie Tech, graduating in 1935. By 1936 he was serving as leader and director of a theater group in Cleveland, Ohio, and by 1938 he had reached Broadway, where he worked in numerous plays until moving to Hollywood in 1941. One of his first movie appearances was an uncredited bit as a policeman in Warner Brothers’ feature High Sierra; the role would set the pattern for most of his movie work. However, in 1942 Columbia Pictures gave him one of his bigger feature roles–the principal heavy in the Charles Starrett B-western West of Tombstone–and gave him another meaty part the same year in their chapterplay The Secret Code. Secret Code was a fast-moving and action-packed wartime espionage serial, marred by excessively repetitive plotting and overly strident propagandistic dialogue. The serial’s actors were first-rate, however–particularly star Paul Kelly as a police detective who got himself dishonorably discharged in order to infiltrate a gang of Nazi saboteurs, and Clancy Cooper as Kelly’s friend and fellow detective Pat Flanagan. 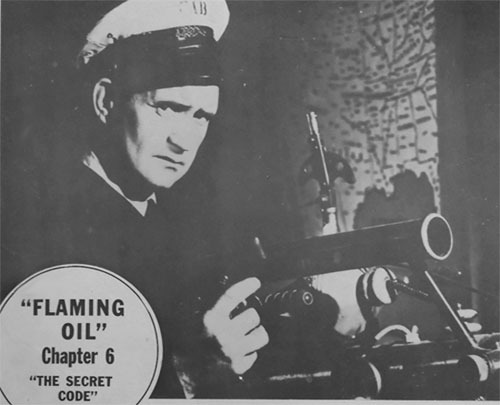 The role of Flanagan was much more rewarding than the typical serial sidekick part; Cooper got to (movingly) convey bitter disappointment at his friend’s apparent disgrace, before finding out the truth and providing Kelly with reliable but not unquestioning support (most unusually for a sidekick, he frequently debated with Kelly over the prudence of the hero’s various maneuvers). Cooper also got to engage in some light comedy, as his character cunningly misdirected the misunderstanding police’s search for Kelly while pretending to be eagerly engaged in their hunt himself. All in all, Secret Code gave Cooper more time to display his skill as an actor than most of his other Hollywood outings. 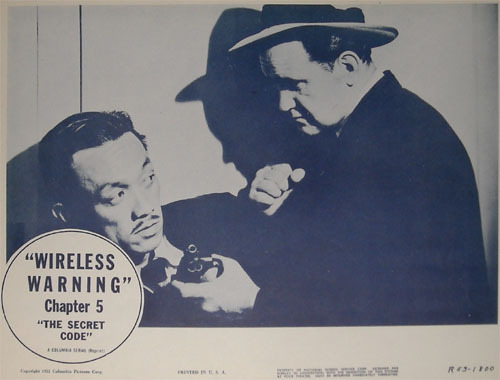 Above: Clancy Cooper pummels Japanese spy Beal Wong in The Secret Code (Columbia, 1942). Above: Clancy Cooper irritates undercover detective Alex Callam in The Secret Code. Cooper continued playing policemen and other background characters throughout the 1940s, occasionally garnering substantial roles (usually as the villain) in B-westerns for Columbia (Riding Through Nevada) and for Republic Pictures (Dead Man’s Gulch). Republic also featured him in one of their serials, 1944’s Haunted Harbor. An exciting adventure serial, Harbor starred Kane Richmond as Jim Marsden, a sea captain framed for murder. Cooper was Yank, Marsden’s trusty first mate, who helped break him out of jail and subsequently helped him look for the real murderer on the “haunted” island of Pulamati. Cooper’s role in Harbor wasn’t as distinctive or interesting as his part in Secret Code, but he was a noticeable presence throughout the serial and did a good job of playing a grizzled and two-fisted sea dog–grumbling about the good guys’ inability to “bust open” mere suspects and cheerfully “busting open” revealed culprits. 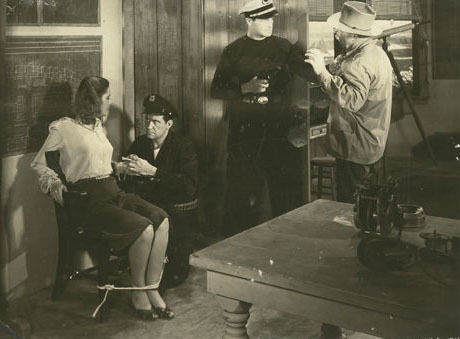 Above: Clancy Cooper aids the captive Kay Aldridge while Kane Richmond holds Duke Greene at bay in Haunted Harbor (Republic, 1944). 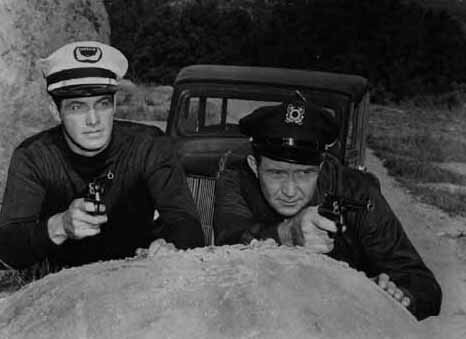 Above: Kane Richmond and Clancy Cooper in Haunted Harbor. 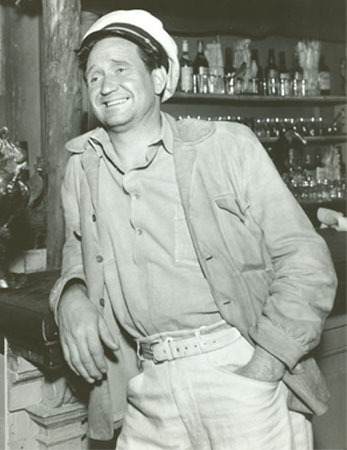 The 1950s found Cooper continuing as a character actor in features like Where the Sidewalk Ends and Distant Drums, while appearing on TV shows ranging from The George Burns and Gracie Allen Show to Gunsmoke. His TV roles were usually more substantial than his feature roles, and in 1959 he landed a regular part on Warner Brothers’ TV Western The Lawman, playing likable bartender Timmo McQueen for a full season. He made his last theatrical appearance in the drama Saintly Sinners in 1962, but kept working–albeit more infrequently–as a TV character actor until he retired in the early 1970s. He died of a heart attack in 1975, while driving in Hollywood. Despite his distinguished background–as college dramatics student and stage performer and director–Clancy Cooper was unable to escape the typecasting curse in Hollywood. When The Secret Code gave him an unexpected moment in the spotlight, he made the most of it, and used his acting talent to to make his unusually multi-faceted sidekick character emerge as one of the most distinctive supporting good guys in any serial. Above: Clancy Cooper in a lobby card for The Secret Code (Columbia, 1942). Acknowledgements: Much of the biographical information on Cooper is derived from the unpublished memoirs of television director/producer Norman Felton, who worked with Cooper on the stage. Until recently, Felton’s memoirs were available online at the University of Iowa’s webpage.